When you get eggs from us, you get a variety of shapes, colors and sizes. Our hens are a reflection of that: the girls are a wide range too. This spring we received a shipment of day old baby chicks and as we approach fall they are just beginning to lay eggs. 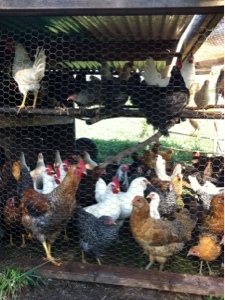 We are hopeful that they will produce eggs all winter: in years past this has worked and we always need eggs!